Ariana Grande's new single '7 Rings' has already set a new record for the most streams in a single week. But now a new version of the music video is making waves online - except this one is done in American Sign Language. The video features US model Nyle DiMarco and was directed by Jake Wilson who formerly appeared in America's Next Top Model. The duo have closely recreated a lot of the scenes from the original video, but with Nyle (who is deaf) in the main role instead of Ariana. 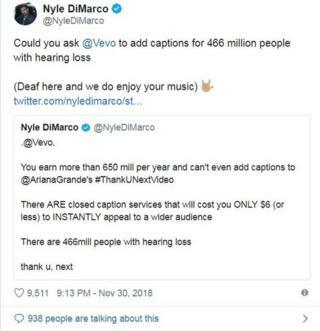 Last November Nyle tweeted Ariana to request that Vevo (who share her music videos on YouTube) add closed captions for those who are deaf or hard of hearing. In a separate tweet to Vevo he wrote: "You earn more than 650 mill per year and can't even add captions to @ArianaGrande's #ThankUNextVideo. "There ARE closed caption services that will cost you ONLY $6 (or less) to INSTANTLY appeal to a wider audience. There are 466mill people with hearing loss. thank u, next." Ariana responded to the messages, agreeing it was a "dope idea", and when "7 Rings" came out earlier this month, it came ready with captions. 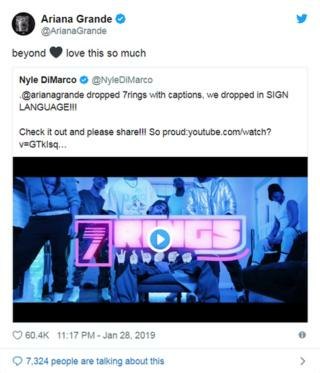 Now that Nyle has made his own ASL version of 7 Rings, Grande has given it her seal approval even sharing it on her social media. This isn't the first time a music video has been made in sign language. SuRie who represented the UK at the last Eurovision Song Contest has recorded a special version of her song Storm entirely in British Sign Language (BSL). Would you like to see more music videos with sign language? Let us know in the comments below. Everyone deserves to enjoy music so I think it's an amazing idea! This is such a good idea! It lets deaf people enjoy music just like the rest of us! Absolutely. That is such a good idea.